Way way back in January, Charlotte of the blog seamripped wrote about how her taste in fabric was radically different from her taste in clothing. I’ve been meaning to write about this ever since. Because I’ve noticed the same thing. As I said in my comment, I love neutral colors and I wear a lot of warm and muted pinks. I wear tons of black, ivory, and camel. But if you look at my fabric stash, you’ll find the color best represented there is blue. Why? I have no idea. I also have lots of lovely colorful and bold prints in my fabric stash, even though I really prefer classic patterns (checks, stripes, dots with the occasional awesome floral). I think there’s a tendency to go for more attention-getting colors and prints in the fabric store because they aren’t in context. You’re judging them purely on their own aesthetic value, rather than the look of an entire garment. A nice black wool looks sort of boring on the bolt, but can look amazing in the context of a beautiful coat. What do you think? Are your fabric choices at odds with the colors and prints you actually wear? I have just recently discovered this truth for myself. My fabric stash has a lot of large bold patterned prints with bright colors. I hardly wear bright colors OR bold patterned prints. I wear small vintage prints if any prints at all. I started shopping for fabric specifically with a pattern in mind and that is helping quite a bit. My last fabric shopping spree consisted of 6 pieces of linen in muted colors (no prints) They shall all become short pants and skirts. I felt like I had been successful in changing my habits. I have enough children that I can use up the especially bright pieces on clothing for them. Yes, using them up on the kids is my fall back too! Good question! And yes, I absolutely have this too. But I am finding that making myself sew from the fabrics in my stash pushes the boundaries of what I wear, in a good way. I can end up wearing more colourful things than I would have otherwise, or just things that are different from what I would ever have imagined. I currently have a floral tunic on my sewing table, which looks to be turning into a lovely garment, but I wouldn’t have looked twice at it in a shop. Maybe this is easier though as I’ve never really had a ‘signature look’ or style – as long as it’s flattering, comfortable and feels like ‘me’, I’ll wear it – so I kind of ‘grow into’ homemade clothes that weren’t obviously for me at first sight. And it means that, while I do try to check myself and not buy outlandish prints in the fabric shop, I can allow myself some freedom just go with what appeals and worry about what I’ll use it for later. I used to have this, but in a different way: I always ended up choosing the safe fabrics with neutral prints, even though they weren’t the best for me. As I grew older and felt a bit more sure about my own style, I found I was going more for bold prints and actually wearing them as well. A lot of my fabric choices are simply inspired by the things I like, or even by movies or tv-shows. Some of my dresses are literal or slightly more subtle references to my interests, and I love it! I do that all the time too! It’s especially good for light neutrals like light camel or sand-beige, because I often notice that a certain shade looks way too close to my skin tone. I totally know what you mean! My stash and fabric shopping reflect so many beautiful prints, but I rarely buy solids, even though I’d really love to make some basics for my wardrobe. I am taking part in the stashbusting challenge this year, and I can’t seem to get through it. Partly for this reason, and partly because I only seemed to think in sleeveless tops when I was working at a fabric store many years ago, so I have a lot of 1m cuts. The last time I went fabric shopping I went with a few patterns in mind and really challenged myself to look for basic colours that I know I will get a lot of mileage out of. I came out pretty well! A piece of grey linen, a piece of charcoal corduroy, and black and white polkadot cotton. When I began to sew, I bought a lot of fabrics with prints or very colourful fabrics. But in fact I notice I don’t like to wear these clothes, it is so strange! For some time I begin to think about what I really like to wear everyday: the colours and the sort of textile because it is a pity to dedicate time to sew a garment you will not wear (and it is also wasting of textile). So I realize that I have really different taste in fabrics and in clothing and I try to think about it when I am in fabrics shops. I’ve found this to be true for myself as well. In real life I live in a sea of neutrals: black, navy, grey, khaki, white, red, & metallics are the only colors I ever wear. But looking at my fabric stash there’s hardly any black or navy in there. Everything is like fuschia or bright teal. My fiance chalks it up to the fact that secretly I wish I were that person but my fear of standing out and clashing keeps my everyday wardrobe staid. That’s really interesting. Maybe you could try incorporating some small doses of those colors if they make you happy! This happens to me sometimes, but I have to say I can generally think of the fabric in the context of what my closet looks like. I wear a lot of bold colors and prints, but I also wear a lot of neutrals– think all neutral with one “pop” of bold– so I can pretty much go for anything as long as it’s not super dainty. I think I buy pretty on point for colors I wear. I *might* buy slightly brighter versions in slightly bolder patterns, but I really to to think about what I already have in my closet and whether or not it will go with other items, and if I’ll really wear it. This, really, is the by-product of a severely limited budget. My current fabric stash has a lot of red, grays, plum, muted turquoise-y blue, and dark pinks. I do wear bright, bold colours and also have a similar taste in fabric for sewing/embroidering although I have found that I tend to automatically get pulled towards bold patterns that look good as a small panel but don’t look so great as a larger piece. I have now started to do the same as Kat (above) and drape the fabric over myself in the shop to see how it looks on a larger scale. I have made a few rookie errors with this in the past! Not so much in color or prints, but the little clothing I do buy is made of what I would call “Difficult Fabrics”. It’s the fabrics I know to be finicky to sew. Like silks, chiffons, ect. Yes!!! So many gorgeous fabrics that don’t go with ANYTHING!! It’s a bad habit. But those bright and bold prints are so attractive and addictive! I’m really happy to read this sentiment from you and others, that you feel sewing and buying fabric has expanded your style in a good way! I guess that is the other side of the coin. When you’re buying fabric, perhaps you get a more clear picture of what you are drawn to aesthetically. Maybe instead of buying less blue fabric, I should just be wearing blue more often! It used to be the case. When I started sewing again after a loooon hiatus, two years ago, my wardrobe was all black – with touches of dark grey and navy…. summer was a bit better with camel and sky blue linen pants joining the blacks and greys. I’m talking work wardrobe here. When I started shopping, I fell for all these gorgeous colours and prints and now my wardrobe reflects them. I think I used to wear what I bought and now wear what I want to wear. So I have (summer) a dusty pale pink linen circle skirt and cropped jacket and a wool teal blue meringue skirt …. I have also made black and grey bottom halves, plus a navy juniper which are my most flattering pants ever…. but i will never go back to the lacy Mediterranean way of living in black! I found a solution to the disconnect between my love of color and print and what I actually wear a little over a year ago when I discovered the world of Modern Quilts. I can play around with all sorts of colors and prints that I wouldn’t wear on my body by putting them in quilts, thus satisfying my urge to work with these fabrics. And then buy the more restrained colors and patterns for garment sewing. I cannot tell you how relieved I was when I figured this out….. Interesting thought…. I have a little bit that is outside of my normal comfort zone. But… my wardrobe IRL is SO SO SO boring, staid and has absolutely nothing of interest. I once bought a new purse about three years ago and it threw my kids into a fit – “But MOM – that brown purse is you, what are you doing with something else?” Says something that my kids can only associate me with one – and only one – purse. I am using sewing as a way to expand my wardrobe. It is so hard to find things that fit, and that is part of the reason I stick with such limited selections. As my sewing skills improve, I want to wear those more interesting fabrics! OTOH, I am very good at sticking with fabrics that work with my skin. I never bring home oranges, olive green, etc that I know will never look good on me, no matter how well sewn. My stash is fabrics that work well color wise, now I need my sewing skills to be worthy of them! i love colour and rarely used to sew in neutrals – i have recently been sewing more “basics” so have made a lot in navy, and i have also been sewing a lot more knits, which seems to push me towards solids and stripes. 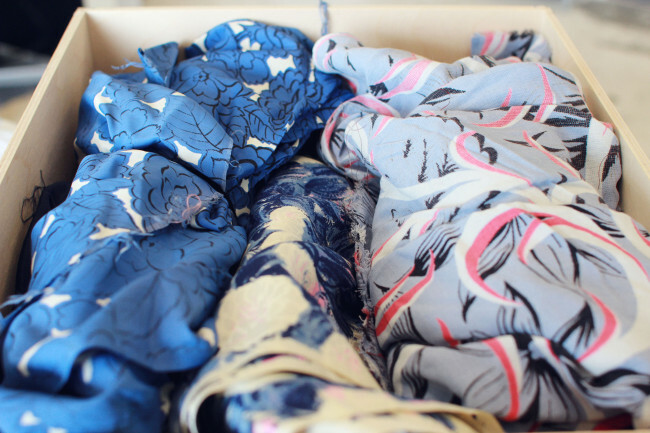 when i first started sewing i went for printed cotton every time – so pretty! but i soon realised that although i love cotton dresses i can’t/ don’t wear them every day in this climate. as a result my wardrobe has become a lot more blanced, and i try not to create wardrobe orphans using things like me made may and palette challenges to try and make sure i have outfits rather than garments. i don’t stash much though, and i do tend to shop with a pattern in mind, so that helps. This post has really made me think about the fabrics I buy, thank you! I love bright colours and do tend to gravitate towards these when buying fabrics but I definitely pick way more prints than I would actually wear – I need to start buying more plain, high-quality fabrics in bright colours, to make more separates for every-day wear. I do lots of online fabric shopping, and it has taught me to be more selective. One thing I like about it is that I can think about that fabric a day or week before buying, and sometimes I decide it’s too large a print, etc. However, I’ve noticed there is a lot of blue in my stash, and lots of prints. Or both blue and printed. That’s true of my wardrobe, too. I have to make conscious effort to buy neutral, solid, and something NOT blue so I have something to wear those prints with! I’ve thought about this topic a lot. I used to purchase fabric with little regard for whether or not I’d actually wear a certain color, pattern, material, etc. just because it looked beautiful in the store. It’s taken me a long time to change my buying behavior, but now I am much better at judging whether or not I’d actually wear a garment made with a certain fabric before I purchase. And, I’d much rather spend my time on something not as flashy, but that I’ll get a lot of wear out and will look good on me than something that is doomed to never be worn. Yes! Thank you for this post. I am drawn to beautiful fabrics, bold and colorful. However, my wardrobe is very basic with neutral colors and simple patterns. Every time I step into a fabric store I know this, but somehow I come home with another bit of fabric that I then spend a year or two trying to figure out how to incorporate into my wardrobe. I’ve been getting better about melding my taste in apparel and my taste in fabric, but it’s slow going. Oh yes, I definitely tend to buy fabric that is very bright and colorful in mostly floral patterns, but in reality I primarily wear darker-color solids. It actually occurred to me a couple of weeks ago that I literally had NO basic cottons in solid colors – not a single one! Absolutely everything in my stash was patterned except for some black and grey wool. I made a trip to the fabric store and stocked up on plain cotton fabrics to add to my stash, and now I am trying to clear out all the fabrics that I know I will never use, regardless of how pretty they are. Yes. I can’t help but pick up at least one beautiful print whenever I go fabric shopping, but almost all of my clothes are solids. I also love to wear light slinky kinds of fabric, but I haven’t yet mastered the art of sewing with them. So I have a sewing stash full of slinky prints, and a wardrobe full of solids and denims. Oh yes indeed! I always go for the fabrics with prints and bright colours, even though I usually wear one item with a print and then a basic shirt or skirt to pair it with. I’ve been trying to be better about this when buying fabric, but I find that the print-section just appeals to me much more than the solid fabrics..
Also when I find rtw clothes I find that the ones in solid colours usually look better than the ones with prints. Strange thing indeed! I actually have a really hard time buying fabric, and I avoid it. Every. Single. Thing. I have made is purple, so far. I think this is because I want fun fabric, but I normally wear things like jeans and black t shirts, or black dresses. So I get solid purple. I swore this linen I got was a dark blue…nope. Purple. I sorta hate fabric. We all just read your comment out loud here and laughed. I buy blue, you buy purple. It’s a curse. I’ve been working very hard to combat this. When I first used to buy fabric, I used to try and find the most unique and crazy fabrics I could get my hands on. If it was the loudest, craziest, or most unique fabric on the shelf, chances are I would want it. I used to love looking at all the different colors and patterns in the stores and running my hands over them, admiring their potential. Fast forward about 6 years, going through my stash one day, I realized nearly everything I had did not match anything I had in my wardrobe and they didn’t even match each other, nor did they match me. Crazy, wild prints are great for summer sundresses, things that stand alone, but not for a working wardrobe. I kept a few fabrics that could be incorporated into my current wardrobe or used as “wearable muslins,” sold what I could at a yard sale, and donated the rest of a local sewing thrift store. Now, when I shop, I carefully consider my needs and true wants. If I get distracted by what us costumers call “the shiny,” I stop and consider if I really need a fancy or loud fabric, what I would make it into, and IF I was really going to make it. Oh, it’s so sweet that you remembered the discussion. Thank you. I’m trying to really consider my purchases and resist my usual “Mrs. Roper’s caftan” prints, so I returned from my most recent expedition with. . .blue. Tons of blue. A single piece of yellow fabric, but mostly blue. My usual gray-on-gray color palette needs a bit freshening up, I guess. I went on a swirly, psychedelic kick last summer, so I hear you on the Mrs. Roper thing. I’ve been pretty good about this. At the very beginning of the year, I decided to start sewing off of a color palette of about fiveish colors. When I first started sewing, I too leapt for lots of prints, but limiting my colors has helped me buy fabric, both solids and prints, that are actually what I want to wear. Also, I think it can be a bit overwhelming when you start sewing your own clothes in that you were formerly at the mercies of the fashion industry- the colors and styles you wore were what you were able to find. Now, anything is possible! Sewing your own clothing really does push you to find what your true sense of style really is, unhindered by the whims of big companies and mainstream fashion, because it requires you to pick your fabrics, your colors, and the designs you choose to sew, and you really can have just about any style of clothing that you want. This is what I’ve started doing, too. Though, I’ve used the “Color Theory” stuff from the 80s and compared it to popular colors today to help me choose. What a coincidence that you wrote this, as just yesterday I posted about making the long-sleeved Violet and wondering why the heck I used a crazy fabric for it when a solid would have been so much more “me.” I’m a beginner, so I am still learning what works and what doesn’t. I’m glad I’m not the only one who suffers from fabric store delusions! Yes! My fabric choices are completely at odds with what I actually wear. It’s really frustrating because I have beautiful fabric languishing in my stash. I either need to wear it or give it a better home. I’ve gotten better the last year or so. I’m not buying as much fabric – just as needed. I consider styling options too. Glad to hear this is a universal issue. Yes! Yes! Yes! I get myself into some trouble when buying. Usually loud out of control prints. I love granny print florals, which no everyone loves. Yay! What a fantastic thing to read. I used to wear tons of black too. I still love black, it’s so simple and classy and easy. But color makes me happy, and it’s interesting to discover which colors feel like me, and why that is. In my quilting I always go for blues and greens (thinks ocean-y blues and lime greens) and those are the coloras that I always wear. The same goes for print size – generally small/medium. I use black, white and grey as neutrals accent pieces. I used to shop for fun prints/yarn until I realized that they didn’t necessarily flatter my figure, so I didn’t wear the clothes I made (this applied for both knitting and sewing, though I only sewn a few garments so far). I try keep my bright, bold fabric choices to fat quarters. I use them in small projects for my daughter; doll blankets, pillows, clothes, little bags, etc. I can still see and love the fabric without wasting it, or trying to imagine it as a slipcover or article of clothing for myself. I figure that if I find a great patterned fabric, it would be terrible luck if someone else had the same dress pattern and styling in mind and we ended up with the same dress. I can’t imagine that ever happening! I have the same fear of being seen in the same dress over and over again! Prints are very noticeable. I love to use them for bags and little things, but never for my clothing. Sad because I really do love and appreciate a gorgeous print. Marimekko’s bright designs are my favorite! I forgot to add that in home decor fabric I always end up buying sea-foam greens, robin’s egg blue, white/cream, pinky peach and some very light greens and blues. Very light pastels in soft floral prints. However, the majority of these colors just do not look nice on me. So for clothes I always end up buying darker colors for “bottoms”(to minimize wider hips and tights though I try to purchase colors other than just browns, blacks, navies, however, it is a bit challenging) and lighter fabrics, more prints for tops to balance my top half with the hips. I love ditsy floral prints and these I use for both home decor and clothes. I love them! However, large scale prints are too overpowering on me so I try to use that for home sewing only. It is so hard to pass up a beautiful print that I know would not work on me…but sometimes I just can’t resist.. I can honestly say my taste in fabrics is the same as my taste in clothes. In clothes I gravitate towards bright feminine, pastels, prints, and florals. And my fabric stash consists of the same thing. Funny to be answering this question now as I just returned from my lunchtime trip to Joann Fabrics lol. I find myself drawn to the same types of fabrics as the clothes I wear, however I do also find that I am a bit more experimental when it comes to buying fabric in the sense that I will see a pattern or color that I may not normally wear and instantly see it as a beautiful flowing dress or fitted pencil skirt. I am always enamored with prints, but I never wear prints. It is my own kryptonite. But, I just adore them, and purchase them all the time. As a lover of color, I think they must be like gorgeous paintings. I really cannot understand it at all. As you said, it is hard to envision a solid as something vibrant and full of life. What I need is a better fabric store nearby. I love prints and color. When I first entered the work world, I wore a lot of black pants and some type of button-down shirt. Boring but appropriate, especially during cold winter months. Now I live in Florida and I love that I can wear dresses every day if I want to. I choose lots of color and prints for my sewn clothing now. It’s nice knowing I can create clothing that makes me feel happy. When I fabric shop I just cannot buy black, camel or beige (at least not in knit fabrics that I seem to favor). My fabric choices are pretty colorful or full of a nice print. I dont have a fabric store near me so its a case of looking for fabric on line for a particular project. I have never been able to get my head around buying fabric just because I like it as I then worry about whether I have enough fabric for any project! I find this very interesting, your ‘blue fabric stash’. As a constant searcher for vintage fabric, guess what the most common colour is that I find? … Blue…which means it was bought often but never used. What alot of good comments ! I just got back into sewing after a long break, and I find choosing fabric to be THE hardest part of the whole process. I have no problem choosing patterns, but with fabric I can’t seem to visualise what the finished garment is going to look like in a particular fabric. I was terrible at geometry, and wonder if visualising a flat piece of fabric made into a 3D piece of clothing is just not my thing. I decided to concentrate on just one item at a time, so I have been making skirts, and getting better and better at choosing a fabric that works with each pattern. My next foray will be into dresses..I love retro prints and florals, even though my wardrobe is full of solids and lots of black, and I find wearing the prints that I love is kinda fun, and has gotten me out of a rut. I think my fabric choices are pretty spot on with my clothing choices – mostly loud and bright and funky and unique. The problem is that no single thing that I sew from my stashed fabric matches anything else, so I have to go out and specifically buy neutrals to make pieces that can be worn with my crazy from-stash items. Gosh, we all suffer from the same problem! i think the issue is that when we look at fabric without any particular garment in mind we are seduced by how lovely it looks on the bolt, or draped across the counter in the store. We see it as a thing of beauty in itself, without giving serious consideration to how it will look draped across our bodies. And then worn as part of our daily routine. This is my excuse for some of the vibrant colours to be found in my stash. The fabric is lovely – beautiful drape, looks fantastic. But if I consider wearing it in a garment, it just isn’t me. I have turned two pieces of strongly coloured silk chiffon into scarves (thanks for the tutorial on a hand rolled hem – just perfect! ), but there are a lot of other pieces that are going to languish. I’ve been a bit more focussed in recent times, and can now reliably find some greys, blacks and blues etc in the stash, so I can make garments that I actually wear. Much more productive, and has boosted my confidence in my ability to sew. A garment, however well sewn and however well fitted, doesn’t feel “comfortable” if the colour or pattern is not quite right. I have black, black and more black fabric (especially poly-blend knits) in my stash than I know what to do with. I do wear black, and I do wear knits, but not all the time! My clothing choices tend toward separates with one black or brown pice paired with red, gold or orange. I wear more solid colors, but I do like prints as well. I have no idea why I have so much solid black fabric lying around! My wardrobe is so much brighter since I started sewing my own. So much so that I need to balance out all my beautiful print pieces with some simple black white and neutrals. So many of my makes that I love I look at and think – I would never pick this up off a rack to try on. Which I think is fabulous. I agree! The fact that my taste in fabric (plaid fanatic over here) is different from what I buy off the rack can be a great thing because it jazzes up my wardrobe. I think there is a balance between buying exciting fabric you’ll mix into everyday wear, and crazy fabric that doesn’t make a garment you’d often wear. I haven’t actually started sewing…yet, but I’m lined up for a few classes and have been browsing the fabric shops. I think my taste in fabric & clothes are the same. I’m attracted to bright patterns in florals or geometrics in a knit fabric (or stripes) — it’s what I wear and it’s what I “hope” I can sew with. Cross your fingers for me. Oh what a fabulous post. I was so frustrated by sewing loads of things that I hated and never wore that I splashed out. Instead of buying yet more fabric to make something I thought I’d wear I had my colours done! Seriously, I do understand that not everyone agrees with the ‘colour theory’ thang, but it has limited my choices to a slightly less boring range of colours and now my wardrobe is starting to actually co ordinate. Having said that I recently made 2 dresses in a lovely knit for traveling to the UK. I noticed that the boring black/brown plain one, was worn a lot, while the garish magenta, teal, squiggly horizontal one made me feel too ‘look at me’ and I only wore it under coats and jumpers – hmmmm, more work to be done here!! But I have a lovely navy wool on the cutting mat as I write, cos I love navy and it goes with almost everything. Yes, fabric shopping while on trips can make for such special memories! And I like to think of it as an art, especially when you’re able to figure out how to make those more exotic fabrics work as functional wardrobe pieces. I have exactly the same problem with RTW as with fabric shopping. I buy very pretty, very colorful prints. Florals, geometrics, abstracts…on blouses, skirts, trousers, even a vintage screen-printed angora sweater. Clothing type doesn’t matter, the majority are prints. My solids are limited. Mainly ribbed tanks and cardigans. But even these are bright and distinctive brights and bolds. You know you have a problem when a yellow tank top and bright turquoise skirt are “neutrals” in your closet. I have been trying to make some solids to coordinate with the prints. Oh my goodness, this post caused a giant, lovely lightbulb to go on over my head. This is such a pertinent issue to consider! Like some of the other contributors, I invested in getting my colors done and it was the BEST sewing investment I ever made–time and money not wasted on the wrong colors. But the issues of prints vs. solids and “personality” of fabric vs. personal style is key. Thank you for asking just the question to further my thinking about my choices, and thank you to all of you who are writing such interesting things about prints (which I, too, find tricky). It helps when fabric stores have the fabric draped over a dress form, because seeing it this way makes it easier for my heart to realise whether I’d actually wear it or not. One problem is that as I get older, the colours that suit me change, but I still like the colours. My skin now gets red very easily, so I find when I try on red or pink tops, the colour doesn’t really suit me anymore. Nonetheless, when I look for fabric I am still drawn to those colours. The majority of my clothes are black, blue and pink but I’ve always been drawn to bright colours. I would say that I have worn them more of the brighter colours since beginning to sew. I have to be quite strict with myself when I go fabric shopping and get dazzled with all of the bright colours and prints. Will I actually wear it? If the answer is yes, then I get it, if no, then I leave it! I’m actually pretty good about this (though it’s probably at least in part because of budget constraints). I’ve also never really been drawn to bright colors or large, bold prints–and my stash reflects this. What I am irresistibly drawn to are super twee little things–lightweight pastels, tiny florals. But I look much better in, and more frequently wear, darker colors, and florals are usually hit-or-miss. So when I find something in a shop, I have to ask myself, ‘now, as an adult, could I wear this without looking ridiculous?’ Usually I’ll (lie and) answer yes, so now before I’ll buy anything, I have to also be able to decide, very specifically, what I’d make from it–not just ‘this could be a dress,’ but a dress with this kind of sleeves, this kind of collar/neckline, bodice fits like this, skirt’s attached like this… If I can, I’ll try to even think of a particular pattern. If I’m not able to think of something realistic before I’ve finished wandering around the rest of the store, then I’ll leave and not buy it. It works pretty well, but I’ve still managed to get a number of things in my stash that I’ll probably never wear. By the way, Sarai, I’m super jealous of your blue prints stash. Blue is by far my favorite to wear, and I don’t think I’ve ever been able to find a blue fabric I liked that wasn’t a solid. Recently I was on a trip to Vancouver & got a chance to visit a notions & fabric store. Although my working wardrobe consists of beige & white as the base … I so went off the beaten path. I got a modern graphic print (charmeuse – hot pink, grey and black blocks print material) for a licorice dress I wish to make. Under a black jacket or funky jean jacket I can totally work this into everyday office wear. I also stayed true to the neutral tone by balancing out with an eyelet material for another summer office dress (maybe a shift which I will line with a nice baby blue material). I’m still learning to sew however now I see the quality of fabric & the design of the prints as a new way to be artistic. My mom was right because she had my colors done when I was young to prove a point. Add color makes you alive! Yes, I’m the same way!! It has only been in the last 3 years or so that I’ve finally started to figure out what fabric I should spend my money on. When I first starting sewing I used a lot of quilt weight cotton because it was cheap, easy to sew and came in so many colors and patterns. While they can work for certain styles of sundresses, for example, they really don’t make the best garment fabric. One of the reasons why I have so much fabric is that I love the colors, prints and textures but in reality I’m a knit shirt and jeans kind of girl. Usually the only time I stray from this is in the summer when I like to wear pretty floral dresses. I also think it might have to do with make you enjoy dreaming up to sew or create versus what you actually want to wear everyday. Oh my, I have done this too with my jewelry & accessories! I started to look at my closet and can see where I needed to jazz things up a bit. My task this year is to reduce the inexpensive garments from my youth & replenish with more quality items. However I’m still keeping my Wonder Woman t-shirt, I’ll just make a meringue skirt to compliment it. Good Stuff! I am so drawn to florals and gemotrics when I look at fabric, (which I do wear) but have learned to drape and check fabric near my face before I buy – so the mix of colour and pattern are flattering. I usually buy solids, and sew with bolder patterns and colour, but if a solid colour has a lovely texture, sheen, or hand (silk, find cotton, nice blends), I am more likely to buy it. My mom — who does not sew, and has no interest in sewing beyond admiring what I make, is amazing at the fabric store (though she is bored when I drag her!) — she zooms in right away on fabrics that would make great outfits– every fabric she suggestes I buy looks great on me and I wear her fabric choices the best. I really am amazed at her knack for visualizing a garment. I think she views fabric in terms of style, rather than as an ‘art work.’ I am swept away by the beauty of fabric, while my mom ‘sees’ an outfit. I am lucky that when my mom helps me select fabric, her choices ressemble stylish garments that I would buy, while my choice look more eclectic and slightly vintage. This is really interesting – this is the year that I am determined to start sewing clothing for myself, rather than bags and other gift items for the rest of the family. My rtw wardrobe almost exclusively exists of dark blue jeans and black t-shirts – with a handful of brighter coloured knit tops to ring the changes. Historically the only “interesting” clothes I every bought were long, full decorative skirts which is where I have started with my clothing sewing. My first make is a long, 4 gored skirt in a black and cream pattern specifically chosen to work with my brown boots and black t-shirts! My next make – a vintage style, full skirted dress which I have bought a blue and pink medium size floral print to make a first draft in. Way out of my normal comfort zone, but I am determined to put more oomph into my wardrobe. I have just realised that this is all sounds really organised and sensible, but the truth of the matter is more that buying clothes or fabric to wear scares me a bit, so I have to think really hard about what I want before I can commit. Thank you for writing this. I thought I was the only one with this problem. My PR name is “Feeling Duh” because I’m so lame at matching fabric to pattern. I buy fabric on sale, patterns, too, and then try to marry them. IRL I wear knits (t-shirts) and jeans in denim or corduroy. My sewing fantasies apparently have me living in woven dresses and pencil skirts. Sometimes. I am mostly a solid color kind of gal. I like simple prints too. When I buy out my normal taste, its mostly to get out of my comfort zone. Now I am the kind of person that will see black wool and get super excited. Got me. It’s not the colour/print I fall for, but the feel and drape of a fabric. I once stumbled about a lovely cotton/silk blend printed fabric that has a rather ugly print, but I bought it anyway because I loved the feel of it, thinking I’d dye over it… and I have much too much chiffon in my stash. Needless to say that I actually prefer wearing fabric that has some body to it and I love tailored clothes. Maybe it’s because when one has to pay more money, buying sweaters etc, then one sticks to neutrals that will go with anything. But fabric, one can usually buy cheaper and experiment and go bold due to the lesser price. They were, but I’m making that mistake less and less, because unless it’s a small print size in a colour I’d pick out if I were buying off the peg, then I’ve realised I won’t actually end up wearing the garment, no matter how flattering or well made it might be. My main problem is that the fabrics I want to sew with, such as Amy Butler or Anna Maria Horner’s rayon challis, don’t come in prints that I’d wear. They’re amazing designs in stunning colours, but not easily wearable. Yes, my clothes fabrics are definitely different from my sewing fabrics. I can’t find patterns that work on me at all, so most of my clothes are fairly plain, but my sewing fabrics are all kinds of interesting patterns.